Yaakov Weiss inspects the digitized image of one of the many diamonds he has analyzed. 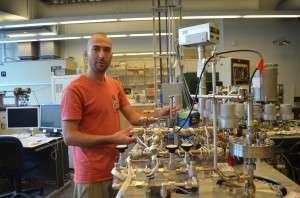 Geochemist Yaakov Weiss deals in diamonds. Not the brilliant jewelry-store kind, but the flawed, dirty-looking ones used more for industry than decoration. Gem-grade diamonds are generally pure crystallized carbon, but many lower-grade stones contain so-called inclusions–chemical intruders bottled up inside the crystal. Inclusions lower the stone's value; but they contain worlds of information about the deep, inaccessible regions where diamonds come from. Their compositions speak to not only how diamonds form (and maybe how to find them), but other basic processes below. "They are the most pristine samples we can get from underlying depths," says Weiss, who works at Columbia University's Lamont-Doherty Earth Observatory. "After a diamond captures something, from that moment until millions of years later in my lab, that material stays the same. We can look at diamonds as time capsules, as messengers from a place we have no other way of seeing." Some of his recent studies are providing new insights to these regions. For most of history, almost everything about diamonds was a mystery; no one even knew where they came from. In the late 19th century, geologists figured out that they erupt in small, oddball volcanic spouts, called kimberlites. These eruptions usually punch through the centers of ancient continents, made of rocks that date back billions of years. The diamonds themselves may or may not be that old. Scientists now believe they crystallize in earth's mantle, 140 to 250 kilometers (about 90 to 150 miles) below. A few may come from as deep as 700 kilometers (430 miles)–the deepest direct samples we have from those depths. At the surface, kimberlites are tiny–usually just a few acres–and hard to find. They are also mostly barren of diamonds; of around 1,500 or 2,000 known, only 50 or 60 have ever been found that are worth mining. Because diamonds are so valuable, many scientists are working to better understand them. But many questions remain. Exactly what raw materials and processes go into making diamonds? What causes kimberlites to erupt? Why are kimberlites, and diamonds, found in some areas, and not in others? Weiss's latest study, on the cover of the leading journal Nature, gets at some of these questions. In it, he and colleagues studied diamonds from the tundra of Canada's Northwest Territories. Prospectors have hunted diamonds across the United States and Canada for centuries, but it was not until the 1990s that the continent's first viable mines were discovered here. Some of the surface rocks are billions of years old, but the kimberlites that penetrated them are the youngest known–as young as 45 million years (others elsewhere can be hundreds of millions). Working with colleagues from the University of Alberta and Durham University, Weiss investigated so called fibrous diamonds–inferior stones that consist of multiple layers instead of a single gem-grade crystal–from the rich Ekati Mine. Inside, they found tiny droplets of liquid–apparent remainders of raw material from which the diamonds crystallized. Most researchers believe that diamonds solidify out of some kind of fluid or fluids; but exactly what those fluids are, and what processes are involved, are controversial. Analyses of these inclusions, and separate research on stones from a neighboring mine, showed them to be rich in carbon, and highly saline–plenty of chlorine, potassium and sodium, much like seawater. Weiss thinks this is not a coincidence. In recent years, other researchers have shown that the complex evolutions of the far north has included repeated opening and closing of ocean basins. A few have wondered if these events could be related to the formation of diamond-bearing kimberlites. Weiss and his colleagues connected the dots. Their research suggests that a slab of watery oceanic crust subducted at a shallow angle under the far more ancient continental rocks 150 million to 200 million years ago. The slab, they say, could have slid more or less intact, underneath what is now the present-day Canadian tundra, where the mines are located. There, they say, fluids from the long-traveled ocean crust reacted with solid continental rocks just above them, in exactly the zone where pressure and temperature conditions are right for forming diamonds. 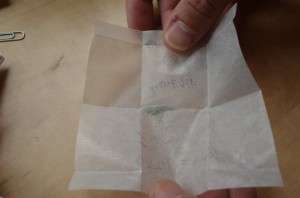 To bolster the case, in addition to the salts in the inclusions, there are trace element and isotope fingerprints that match the composition of seawater from this time, they say. Whether the reactions had something to do with driving the kimberlite eruptions to the surface is an open question. Among other things, the study may help open the way to reconsidering the source of carbon for diamonds. As far as anyone can tell so far, most of the carbon seems to come from the depths of the mantle. But in recent years evidence has been building that at least some of it was once on the surface, and was shoved down by subducting tectonic plates like the ones Weiss proposes. A recent study by Lamont geochemist Peter Kelemen argues that the carbon can come from either the surface or the deep earth, though very little from either source gets turned into diamond. Weiss's current study does not examine this question. Are there more deposits to be found? Since the 1800s, scattered single diamonds have been found in many U.S. states and Canadian provinces, but almost none can be traced back to kimberlite sources. Some kimberlites have been uncovered, but most don't contain diamonds. One small mine operated in rural Arkansas in the early 1900s was quickly worked out; it is now a state park, where amateur diggers occasionally still find diamonds. Diamondiferous kimberlite was found in Colorado in the 1970s, but it was too poor for mining. The processes described in the Northwest Territories might have taken place elsewhere, but that remains to be seen. "Now it's time to look at fluid inclusions from other places," says Weiss. "Maybe the same things are happening in other areas. Maybe not." Weiss continues to work on related questions. At any one time, he has about 100 diamonds used for research. They are generally fingernail-clipping-size chips from larger stones. He keeps them wrapped up in elaborately folded small papers, labeled with origin and other information. In addition to Canadian diamonds, he has stones from Zimbabwe, Guinea, South Africa, Siberia and Brazil. Most have been loans or gifts from friends or colleagues, though a few years back he paid about $700 to a dealer in his native Israel for a half-dozen 1.5-carat African stones. 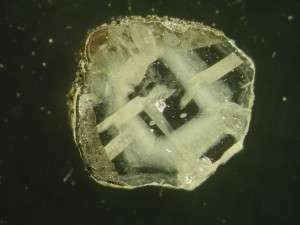 Most of his investigations do not harm the diamonds; inclusions often can be analyzed by passing microscopic light beams or X-rays through them. However, in one new project aimed at diamonds from unusually deep regions, Weiss plans some destruction. To analyze isotopes of helium gas trapped within, he has to pulverize the diamonds to release the gas. (Diamond is the world's hardest substance, almost impossible to wear down–but a direct whack with a hammer will shatter one. Repeated beating turns it to something resembling fine granulated sugar.) "It seems crazy to crush diamonds, right?" he admits. "But it's the only way to get at that particular question." 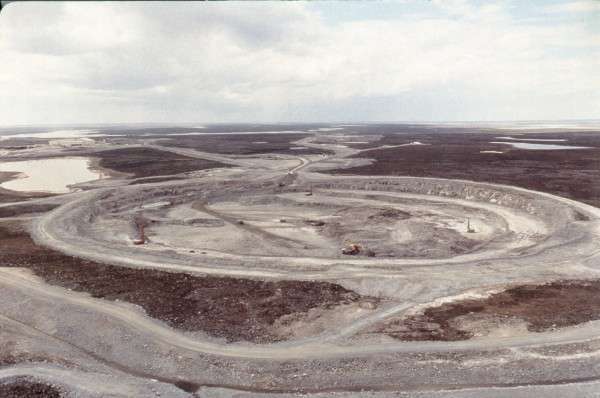 The Ekati diamond mine, on the tundra of Canada’s Northwest Territories, source of some of Weiss’s samples. The geochemist is interested in the origins of North American diamonds. Last year, Weiss published another paper about tiny droplets of fluid found encased within African gem-grade diamonds. Such droplets are fairly common in boart diamonds–inferior specimens like the fibrous type–but not in gems. Many scientists contend that boart and gem-grade stones crystallize out of two different kinds of fluids. To test the idea, Weiss obtained two very rare single-crystal stones containing fluids–one from South Africa's Finsch diamond mine, and one from a river deposit in Kankan, Guinea. The gems' fluids turned out to be similar to those in boart–a challenge to conventional theory. Such research could have practical applications. For one, greater knowledge of trace elements in diamond inclusions could lead to chemical "fingerprints" that would tell where commercial gems originated. This would allow better enforcement of the Kimberley Process, the 2003 UN agreement to blacklist so-called "blood diamonds" from nations where mining is controlled by warlords or corrupt governments. The process currently depends on paperwork that can be easily faked. In the lab, with a mass spectometer, used to analyze minute bubbles of gases trapped within diamonds. Beyond this, "understanding diamond formation can tell us about the deep earth's carbon cycle, which we have very little knowledge about," says Weiss. This is the long-term movement of vast amounts of carbon from the atmosphere and surface down into earth's interior, via biological processes, chemical weathering, subduction of tectonic plates, and then back up again via large, more conventional volcanic eruptions. The cycle is thought to play key roles in controlling climate and biological evolution, and in unseen processes far below the surface. For all his expertise, Weiss has to admit: he has yet to visit a diamond mine. As a student in Israel, he considered collecting samples in conflict-ridden areas of west Africa, but his adviser discouraged him. "He wanted me to stay in the lab and stay alive–not get killed in the field," he says. The mines in northern Canada are safe, but hard to get to–far out on roadless tundra, accessible only by charter aircraft. "I'm still hoping, some day," he says. "Diamonds–they're a very nice stone. It would be fun some day to see where people are finding them." Most of the techniques used to analyze diamonds are harmless–but to get at gas compositions, the diamond has to be crushed. This is all that remains of one previously studied stone.